Framlingham Castle in Suffolk was already popular with families thanks to a great activity programme, a high-level wall walk and - well - being a really cool castle. 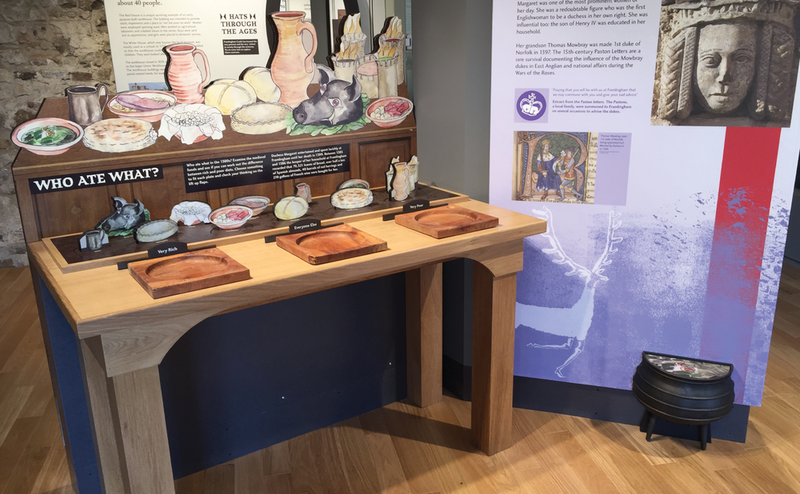 English Heritage asked us to develop displays for a new exhibition that would increase interactivity, and help people better understand the castle’s chronology through almost 1000 years of action-packed history. The new exhibits were replacing a fairly recently commissioned display which was being ousted by a cafe upgrade so we looked to retain what was still working for them - a lot of resource had gone in to an animated film in particular. We created a simplified and clear chronology for the exhibition which was used to re-edit the film. We also developed a custom interactive activity for each stage of the new storytelling. We later worked with the Learning Team on new trail products for both family audiences and schools visits. The project was shortlisted for a Hudson’s Heritage Award in 2018, in the ‘Most Improved Development’ category.